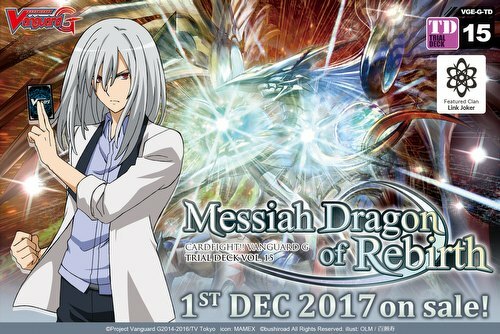 The Cardfight Vanguard: Messiah of Dragon Rebirth deck is a new trial deck for the clan that Kouji Ibuki uses - Link Joker. This deck can be powered up with cards from the upcoming Rondeau of Chaos and Salvation boosters. Each box contains 6 decks. Each pre-constructed trial deck contains 54 cards (50 card deck plus 4 G unit cards), a first guide, a play mat, and a Link Joker clan card. There are 18 different cards in decks (14 new cards and 4 reissued cards). One Vanguard G postcard will be included in every deck. Look for the all new Grade 3 "Messiah" as well as reissues of "Alter Ego Messiah" and "Destiny Dealer."